Water coming up from the basement floor can lead to big headaches. A flooded basement can cause interior damage and even destroy irreplaceable mementos like your family photo albums or heirlooms that you may have been keeping in storage down there. And as if that wasn’t all bad enough, water in the basement is also a serious health concern as it can lead to mold. Water in the basement is one of those nightmare scenarios that you’d like to avoid at all costs. Even if you’ve only had a little bit of water before, you know that a heavy rain could tip the scales in the wrong direction. That’s why you want to understand how or why water can get into your home in the first place—and what you can do about it. You might be asking Why is water coming up through my basement floor after heavy rain? The truth is, if water is coming from the floor up (as opposed to dripping down walls), then it is probably due to a subsurface problem. Subsurface groundwater under hydrostatic pressure is a serious concern and one that cannot be ignored. We’ll explain a bit more about what this means and what can be done to protect your home from these water woes. First, you need to understand what hydrostatic pressure means, as it’s your key enemy in the battle against a flooded basement. Hydrostatic pressure is the water pressure pushing against your home’s foundation. This force can be incredibly powerful. If your soil is heavily saturated after a heavy rain, there could be tens of thousands of pounds of hydrostatic pressure pushing on your foundation—making it likely that it’s going to find its way in. With that kind of pressure, water will come through even the tiniest of cracks. The installation of a sump pump is an essential step when it comes to removing water from your basement’s sump pit. This pit is designed to keep water out of your home by collecting it from other areas of your basement via a drain system. But you also want to send that water away from your home to an area where it will no longer be problematic. This is why you also want a sump pump. We can install a submersible sump pump with a cast iron, epoxy-coated float and a geo-wrapped pump to prevent sediment from getting in. We will also install check valves to ensure that water only goes in one direction, preventing backflow into your sump pit, which can also lead to flooding. Of course, if you have water in more than just one area of the basement, you might also need to consider an interior tile drain system. That’s because a sump pump and pit will only resolve water in the general area of the pit. If the water is not directed to that area, in some way, you’re still going to be dealing with problems. An interior tile drain system will capture water at its most common point of entry (the basement floor/wall joint) and will then direct it to the sump pump area to be flushed out and away from your home. At Adams Foundation Repair & Waterproofing, we install the patented Hydro-Channel Basement Drainage System, which is both durable and proven. An interior tile drain system plus sump pump/pit is a fully comprehensive solution that will solve your water worries. It is also generally more cost-effective than other waterproofing options that exist. By educating yourself and exploring what’s out there, you’re already taking the first step toward protecting the investment in your home. After all, the last thing that you want to do is have to worry about water causing you costly damage or ruining irreplaceable family items that you’ve stored in the basement. 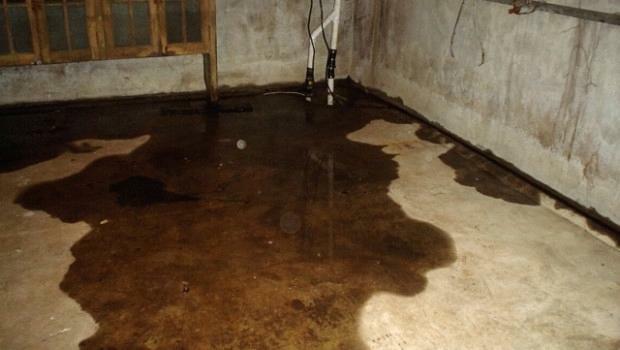 If you’d like to learn more about how you can stop water coming up from the basement floor, then reach out today for a free estimate and more tips on how you can put effective solutions in place. We can work together to ensure that your home is protected from water damage in the future.